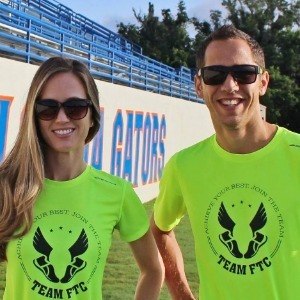 Coach Enoch, a former UF runner, has worked with countless runners of all ages and abilities. He enjoys sharing his passion and knowledge of the sport with all of his runners. Coach Enoch has run a 2:17:06 at the Boston Marathon, 1:03:55 half marathon, 29:40 10k, 14:05 5K, qualified for the 2016 and 2020 Olympic Marathon Trials. Over the past 15 years, Coach Enoch(pronounced e-knock) has worked with countless runners of all ages and abilities. He enjoys sharing his passion and knowledge of the sport with all of his runners. Enoch loves helping runners achieve their goals and dreams. Coach Enoch first found his love for running in the 9th grade at Keystone Heights High School. As a member of the cross country track team, Enoch took it upon himself to learn all that he could about running. He would go on to coach himself to multiple top five state championship finishes, and under his guidance, help his cross country team finish with its highest place in school history at the state meet. Upon graduation, Enoch was awarded a cross country/track scholarship to the University of Florida. During Enoch's freshman year at UF, he coached local High School Senior, Jeremy Criscione. Under Enoch's coaching Jeremy won the Cross Country state championship and set a State Record for the 5K and a 2-mile State Track championship. At UF, Enoch was a multiple All-SEC Conference and South Region Honoree. He was the captain of his Cross Country team and won numerous invitationals around the southeast. Enoch still holds top 10 time records at UF in the 8k and Steeple Chase. During Enoch's time at UF, he worked closely with the coaches and gained much of his running knowledge from some of the top minds in the sport. Success. Coach Enoch Nadler has been notified of your message.